A new Walt Disney World hotel called Disney’s Art of Animation Resort will be built to open in 2012. Disney’s Art of Animation Resort will be built across from Disney’s Pop Century Resort, utilizing the unfinished half of that hotel that was originally slated to be called the “Legendary Years” section. Now it will be transformed into a new 10-wing hotel that will be priced at the “value” level. Other Disney “value” hotels include Pop Century and Disney’s All-Star Resorts. 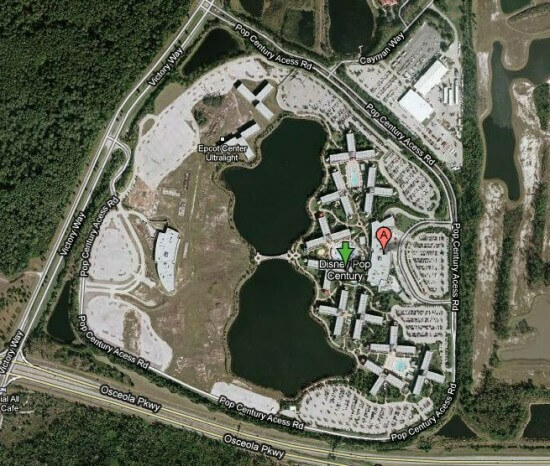 This map of Disney's Pop Century Resort shows the completed "Classic Years" section to the right of the lake and the unfinished "Legendary Years" section to the left, which will soon be made into Disney's Art of Animation Resort. The hotel’s decor will include many of Disney’s classic animated films and, like Walt Disney World’s other value hotels, will feature oversized sculptures of characters. One sculpture to become part of Disney’s Art of Animation Resort is King Triton from The Little Mermaid, pictured above being scuplted by Walt Disney Imagineer Joni Van Buren. This new sculpture will tower at 35 feet tall. The four movies that will be prominently featured at Disney’s Art of Animation Resort will be The Little Mermaid, The Lion King, Finding Nemo and Cars. Disney’s Art of Animation Resort will also contain a building to house the check-in lobby and restaurants. Construction on the new hotel is scheduled to begin this summer with a completion date scheduled for some time in 2012. Disney can’t build anything Marvel east of the Mississippi. Your friend is not an imagineer. Actually they own the rights outright to all of Marvel Comics as they have purchased those right for 4 Billion in 2009. Now in 2009 there were about 5 to 7 additional movies still under contract with Sony & Paramount with will conclude in late 2012/early 2013. Universal contract with Marvel is written with all rights to use explained clearly as to use and any misuse allow Marvel to viod such contract as breach which means Disney retains such rights…Basically, don’t be suprised if Disney has a Marvel Hotel in the works…Generally they work 5 years out on any plans and based on her original comment in 2010….Look for a Marvel Hotel construction to begin 2015/2016 with the real release of the design/concept in 2016ish. I am so happy to see disney doing something with the other half of POP and with a 2012 opening I can not wait to book a trip to visit this new hotel. Outstanding news. I can’t imagine this not becoming our family’s favorite place to stay. I am a little disappointed that the Legendary Years idea is being scrapped for something that sounds vaguely like All Star Movies. But I am glad that the area will finally get cleaned out. Wow sounds like an awesome theme. Can’t wait. THIS NEWEST HOTEL WILL BE AWESOME ON 2012? Book my trip for 8-2012 can’t wait to enjoy all the new area’s and buildings surrounding the new Resort.See ya soon.